Pyotr Il’yich Tchaikovsky’s best-loved opera is based on Alexander Pushkin’s verse drama of the same name. It provided Tchaikovsky with an opportunity to present everyday and authentic experiences on the stage, in contrast to the epic narratives that characterized much European opera of the time. Eugene Onegin quickly became a firm favourite with Russian audiences. Within a decade of its 1879 premiere it had been performed over one hundred times in St Petersburg. Continuing a long collaboration with the Royal Opera company, 59 Productions were invited to collaborate on this Covent Garden debut for artistic director Kasper Holten. Using mapped projection to augment and interact with designer Mia Stensgaard’s beautiful sets, the use of carefully placed video effects helped the production blur the line between dreams and reality in this exciting new interpretation of this classic Russian masterwork. Trees the colour of blood oranges, black georgette ballroom gowns rippling as if cast from jelly moulds, a snow scene whipped and blurred as you might see from a train crossing the Steppes: the Royal Opera House’s new Eugene Onegin, conducted by Robin Ticciati, directed by Kasper Holten and designed by Mia Stensgaard, looks magnificent. Mia Stensgaard’s set (enhanced by Leo Warner’s video designs which bring nature into our midst) undergoes dramatic transformation in the shift to St. Petersburg. A succession of huge rooms recede where once were fields. 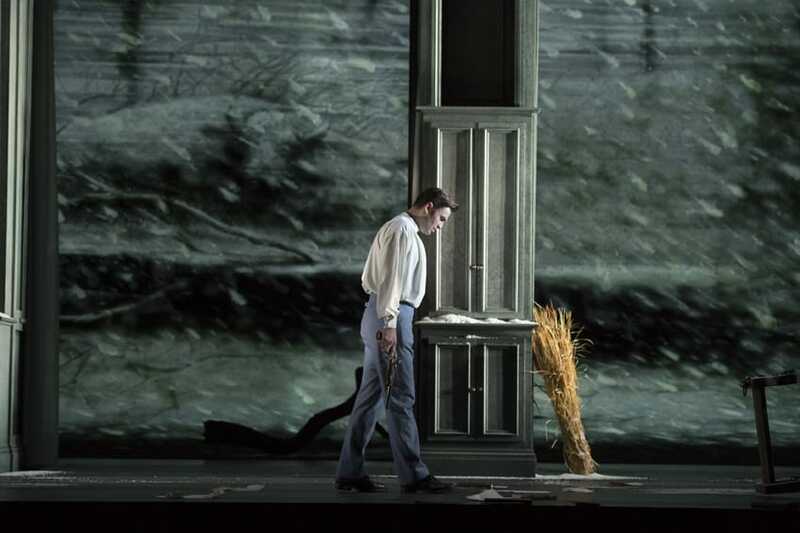 The arrival of Prince Gremin (the excellent Peter Rose) into the midst of the final Tatyana/Onegin confrontation is Holten’s final coup de grace. Tatyana is locked into the compromise of a loveless marriage. 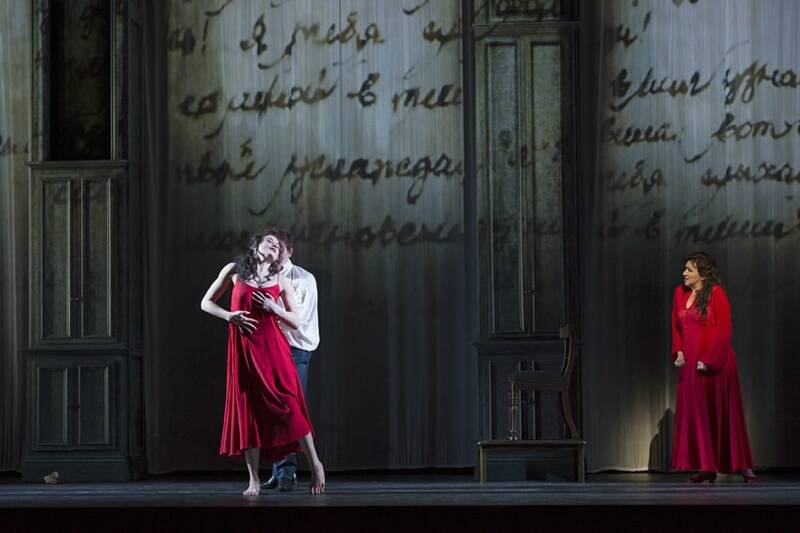 Passion, as forever enshrined in Onegin, is locked out. the unforced articulation of every feeling goes straight to the truthfulness at the heart of Tchaikovsky’s masterpiece. 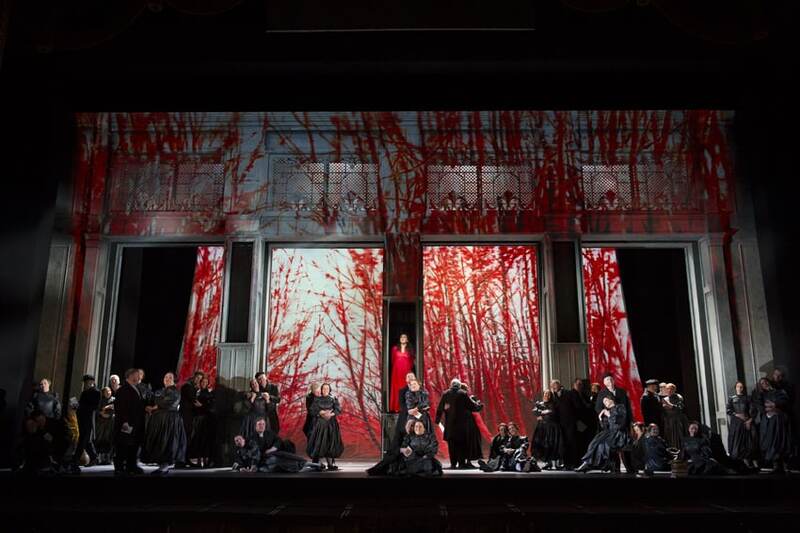 Holten’s team of singing actors is equal to the challenge; Robin Ticciati’s conducting and Wolfgang Göbbel’s lighting of Mia Stensgaard’s clever, singer-helpful set follow the fluctuations with painstaking sensitivity.